Getting on the ice started very early for Luke Tuch with an outdoor rink in his backyard. It also didn’t hurt that he had a competitive side when it came to hockey. Hockey wasn’t his only love as he also played lacrosse growing up, before focusing only on hockey a few years back. “Lacrosse really helped me with my footwork and my hands in hockey,” Tuch said. 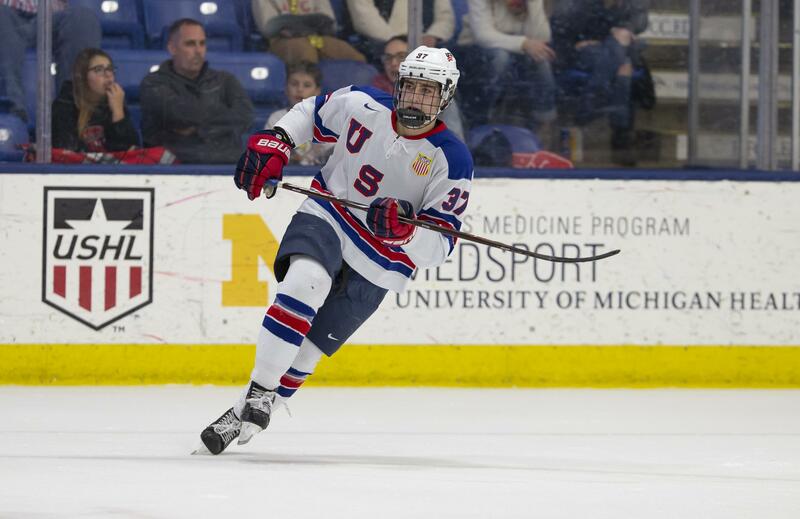 After leaving his home in Baldwinsville, New York, and playing for the Buffalo Jr. Sabres last year, Tuch earned the opportunity to represent this country. The 6-foot-1, 197-pound forward knew how important it was to be a part of this program. 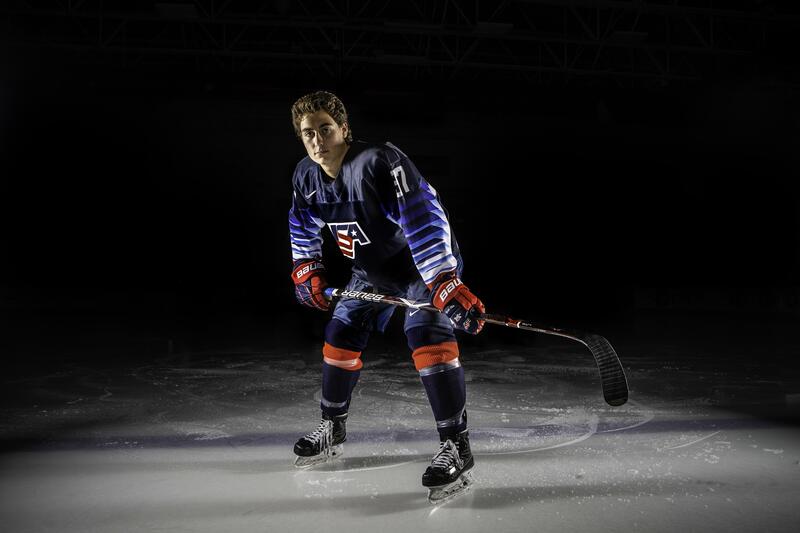 One of the great things about playing for USA Hockey’s National Team Development Program for Tuch was that he had another person he could turn to for advice on the NTDP — his outdoor rink buddy and older brother Alex. Alex played for the NTDP from 2012-14 and is in his second season with the Vegas Golden Knights. “He was someone that I always looked up to growing up,” Tuch said. “He told me to work hard and be humble. You cannot take anything for granted and you will need to work hard each day both on and off the ice. The transition to the program can be a challenge, but for Tuch, he already knew a little about it after seeing and hearing what his older brother went through. In addition, this will be his second year away living away from home and seeing his twin sister Leah. He knew how important it was to play for Team USA to develop his game, both on and off the ice. “I have already seen an improvement in my game,” Tuch said. “I’m really putting into play being a power forward. Prior to this year, I was able to go through guys. Now, since we are playing against bigger and older guys, I really need to learn how to use my body to make space and get around players. You have to pay attention to detail and focus on every item. I spend time in the shooting room, working on improving my shot. You do everything to get better. For Tuch, it’s all about doing the work. The next challenge for Tuch and his U17 teammates will be the 2018 World Under-17 Hockey Challenge in Saint John and Quispamsis, New Brunswick. The tournament, which runs Nov. 3-10, will feature the top under-17 players from Canada, Czech Republic, Finland, Russia, Sweden and the United States competing for a gold medal in tournament action. “It is definitely a task and a challenge but we are going to be ready for it,” Tuch said. “It will be great to see how we match up with other players from our age group. It will really seem real when we put on our jerseys and face off against other countries. He understands that it will take a maximum effort to earn the tournament title this season. One thing will never change for Tuch and that is how much it means to wear the colors of his country each and every day. With each day, Tuch is finding a way to carve his own path on the ice.